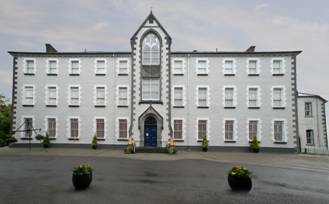 Cavan County Museum is located in the restored 19th Century Poor Clare Convent. Our collection consists of valuable artifacts relating to Cavan’s history including a wide range of medieval and archeological pieces. Displays of notable interest include the Killycluggin stone and the three-faced Corleck Head, they are two of the most recognisable examples of Celtic spirituality in the country. Our accessible exhibition space plays host to regular shows by local and national artists. The playground is a big hit with our young visitors. Storytelling and clay modeling are also available to children’s groups upon request. Our coffee and craft shops are ideal for those wishing to relax, browse or perhaps take purchase a memento of their visit to the museum. The museum caters for large and small groups. Guided tours are available upon request. There are seats available on ground, first and second floors. There is a lift to first and second floor level. All staff has received disability awareness training. There is a wheelchair available. Please ask staff. Evacuation chairs are provided with fully trained staff. The children’s playground is located in the Museum’s gardens. It allows local children and children visiting the Museum the opportunity to have fun as well as learning. The galleries and displays are fully accessible. The garden paths are accessible to all. Many galleries now contain touch screens computers that give information on the displays. The touch screen displays incorporate sound, text and images. They are located at an accessible height.